The novel had been sitting in my TBR pile for several months. I had made several attempts to start, but life always tended to get in the way. That’s actually a fairly accurate summary of my 2019 reading life — everything else always seems to get in the way of my reading. When Spring Break arrived, I realized this was my opportunity to escape into the world of Jodi Picoult again and explore A Spark of Light. A Spark of Light is set in Jackson, Mississippi and traces the events of a single day at The Center – a reproductive health center…..an abortion provider. George Goddard enters the bright orange building, asks what they did to his baby, and pulls out a handgun. Shots are fired. Blood is shed. Professionals and patients in The Center now find themselves as hostages. Hugh McElroy, the police negotiator celebrating his 40th birthday, is called to the scene in an effort to end the standoff before the SWAT team is sent in. Once he arrives at the scene, Hugh makes an unsettling discovery. Two of the women in The Center are his older sister, Bex, and his 15-year-old daughter, Wren. In typical Picoult fashion, A Spark of Light is a gripping tale. The narrative shifts between character perspectives throughout each chapter that explores the events of each hour of the fateful day at The Center. Surprisingly to this reader, the timeline emerges in a reverse-chronological fashion, exposing many of the causes of previously seen events. Picoult’s characters are beautifully drawn and are anything but one-dimensional. Just as you think you understand a woman’s choices, you learn that there is more to her back story that is vitally important. Is this novel about abortion rights? Yes and no. Of course, the issue is present throughout the book with its views of providers, patients, and protestors. However, I didn’t feel as though I was reading a treatise on the issue of abortion in the US. (When you read the author’s note at the end of the book, Picoult’s views on the topic become much clearer in case there is any doubt though.) Instead, the novel itself was an examination of humanity and how a cast of characters may respond to the abortion debate while attempting to explain how they might have arrived at their view. While I did not always agree with Picoult’s characterization of some groups, I thought that she ultimately managed to treat all considered equally and with respect. I’m always fascinated by the titles of novels. The use of A Spark of Light is explained in the closing chapters of the book. While traveling to The Center from his Atlanta home, Dr. Ward (the central abortion provider of the story) is catching up on his reading of medical journals. In one of his articles, researchers have observed that at the moment of fertilization, a rush of calcium into the egg caused the release of zinc. As the zinc exited the egg, it attached to fluorescent molecules, creating a tiny spark of light. Once again, Jodi Picoult has produced a fascinating novel that addresses a topic that is relevant to our culture. She examines the issue from both sides of the argument with grace and clarity. By inserting heart and the human condition, Picoult shows that things are not always as black and white as we might initially perceive. I can’t wait to read whatever she writes next. Although my reading has been much slower than I had hoped in the first 3 months of the year, I am THRILLED that I took the time to read this amazing novel. It has quickly become one of my most highly recommended books for anyone that is fascinated by stories of World War II and historical fiction in general. The Nightingale traces the lives of two sisters, Isabelle and Vianne, in occupied France at the height of the Great War. Isabelle is determined to do something to fight the atrocities that she sees around her, even if it means risking her own life. Vianne decides to remain neutral as she watches Nazis move into her small hometown because she must do whatever is necessary to protect her home and her young daughter. When Nazi officers billet in her home, Vianne finds herself facing a moral dilemma that will forever impact her friends, her community, her children, and herself. Kristin Hannah’s novel provides an insightful look into the plight of the Jews in France as well as the heroic and terrifying roles women played in the War. If you dare to read this novel, you are guaranteed an adventure as you accompany downed fighter pilots through the mountains and provide false papers to Jews attempting to escape. Readers will get a first-hand look at the horrors of work camps and will observe the fear and hopelessness found there. Quite simply, I don’t think it is possible to experience The Nightingale and not be significantly changed. It is one of my top 10 novels of all time. I highly recommend it to book lovers everywhere! Where did we come from? What is our purpose? Where are we going? These questions have filled human thought for centuries and now become the inspiration for Dan Brown’s latest novel, Origin. Robert Langdon returns as the hero of this fast-paced, intriguing page turner that you certainly do not want to miss. A young scientist who is also a well-known Atheist claims to have discovered new information about the origin of life on Earth. As he prepares to make his announcement to the world, he is mysteriously assassinated in front of the luminaries gathered in the modernist museum as well as millions of people around the world. Was he killed by the Church in an effort to silence the news that would potentially shake the foundation of the world’s faith communities? Or was the murder ordered by the royal family of Spain? The story takes the reader through the beautiful, lush scenery of Spain while examining spectacular masterpieces from the visual arts and the world of science. With the addition of Winston, the scientist’s stunning AI assistant, Origin introduces a new type of character that is rarely encountered in popular literature — and results in a most satisfying reading experience. I found myself connecting with Winston’s computer-generated voice just as I did the human characters created by Brown. The novel really is one of the author’s best-crafted novels. Don’t pick up a copy of Origin until you have some free time on your hands. You won’t be able to put it down until you reach the book’s final page! Earlier this week, I completed my first book of 2018. What took me so long? I am trying to read multiple books at the same time, so my pace of reading is slower. (I’m not sure if I like this approach or not, but I’m continuing this way for a bit longer.) January has been an extremely busy month for me, so reading was not always a priority. Thankfully, what I DID manage to read was quite enjoyable and a great way to start the new year. The Alice Network is actually two stories woven together. Eve was a British spy in World War I near the German front. As a member of a network for female spies — the Alice Network — she gathered information while waiting tables in a lavish restaurant….and in the bed of the establishment’s proprietor. After the end of World War II, Charlie St. Clair returns to France in search of her beloved cousin, Rose. Through the course of this enthralling novel, Eve and Charlie learn that their stories share a common enemy and the unlikely pair join forces to overcome the evil that continues to permeate western Europe after the War, personified in the life of a single man. Richly developed characters combine with the beautifully described scenery in a compelling story that makes The Alice Network a must-read for those who enjoy historical fiction. Eve and Charlie will quickly become literary friends whose tales will urge the reader to constantly return to their story in order to find out what happens next while enjoying the wit, sarcasm and banter between these two fierce ladies. 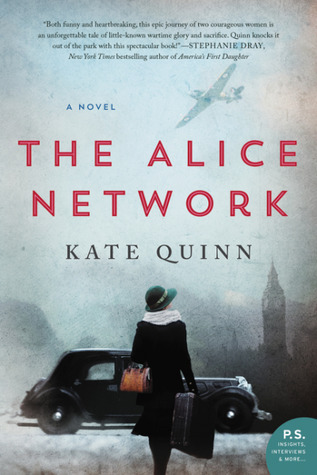 I highly recommend Kate Quinn’s The Alice Network. First, a word about what appears to be an error in my numbering system. Somehow the numbers on this blog and my Goodreads challenge list for 2017 have managed to get off from each other. I still haven’t really figured out what is going on, but after repeatedly counting the books that I have read this year, I am able to confidently say that this is actually the 29th book of the year. One more book before January arrives and I will have achieved this year’s goal of 30 books! I’ll be more careful about the numbering in 2018, but for now…. As has become my tradition for the past few years in the week leading up to Christmas, I found some piece of fluff holiday writing to pull me back to a simpler pace and focus my thoughts on the important things of the season — family, love, and the Savior. This year’s Christmas novella was Unwrapping Christmas by Lori Copeland. The story centered around a busy mother who has become so enthralled with taking care of everything on her agenda that she has forgotten to care for the people she encounters, including her small family. When a fall on the ice threatens to foil her plans for the family’s Christmas Eve celebration, she learns how important it is to pause during the Christmas season — and throughout the year, as well — to make sure that what is most important is receiving the most attention. This piece will not win any major literary awards. Its plot is easy to predict. Its message, however, hit me clearly between the eyes in the midst of a busy season. While I don’t recommend it be read for its literary value, it was a story that I encountered at just the right time. Now back to our regular programming here on Reading for Me…..
I’ve been trying to write this review all week, but things have been so busy that I simply haven’t been able to get around to it until now. I finished reading A Time to Stand late Sunday night on my return trip from a visit home for the Thanksgiving holiday. While I don’t read a lot of Christian fiction these days, Robert Whitlow’s novels continue to be some of my favorites in the genre because they are always engaging and thought-provoking. A Time to Stand is set in a small Georgia town that has found itself in the spotlight after a robbery of a local convenience store. When the injured worker names an African-American teen as one of his assailants, police begin searching for him. The young man is found on a white officer’s beat. The officer instructs the teen to move into the light so he can be seen clearly. Instead, the youth begins running towards the officer, hands in pocket, when a gun shot is heard. The white officer shoots — critically injuring the black teenager — and setting off a racial firestorm in the rural town. Adisa Johnson, an African-American attorney, finds herself in the small town as she cares for her aunt. Adisa also finds herself without work after she was fired from her high-profile Atlanta law firm. When she is offered a job with a local law office, Adisa is elated until she examines the string attached to the job offer — she must assist with the legal defense of the white officer. Whitlow’s examination of police violence and its impact on community relations is nicely presented. With impressive clarity, the author shares the anger of both races as well as their fears and doubts about the situation. To further the dialogue, the inclusion of Adisa’s aunt and a local pastor as spiritual giants allows the reader to examine both arguments from a Scriptural perspective. After reading the book, I came away with a renewed understanding of the importance to fervently pray for the peace of communities large and small throughout our Nation while hearing the call that it is “Time to Stand” for Truth at any cost — even when Truth may challenge society’s consensus on the subject. This classic novel has been on my TBR list for years. I would always find a reason not to pick it up. Now I’ve finally gotten through it and my response is an indifferent “eh.” I’m not sure if my opinion was influenced by the fact that life was extremely busy with NATS and opera production week while I was working my way through the short book or not. I could not get excited about the turmoils of Ponyboy, Soda Pop, and Johnny. I found myself thinking that this was a novel attempting to ride the success of West Side Story and failed. I read the book because I started it and felt that “I needed to.” My apologies to the many people who told me that The Outsiders would become one of my favorite novels….it’s not. I’m almost finished with this series….I’m almost finished with this series……That seemed to be my mantra as I read 15th Affair. This time, Lindsey and her friends find themselves facing a Chinese spy ring, an exploding aircraft, and missing corpses. Just another typical day in the lives of the Women’s Murder Club. To make matters worse, Lindsey’s husband, Joe, has left without a trace. Is Joe dead? Or has he run away with another woman? The best thing I can say about this novel is that there are only 16 of these novels currently in print, so I have finally caught up. It has been a fun series, but I am definitely ready to get away from these plot lines for a while. I had picked up a novel from another series to read as my next novel, but I just can’t seem to get involved with the story. I think it’s time to read something with a little more substance that will grab my attention for a little while. I returned to my Library Shelf project with Dorothy Simpson’s Doomed to Die. This mystery novel featuring Inspector Luke Thanet was another quick read, but definitely had a convoluted plot line. The twists and turns were unexpected and were not adequately prepared; this reader felt as though he was on a constant roller coaster ride through the novel’s pages. The story centers around a young artist who is found dead in the kitchen of her friend’s cottage after telling her husband that she wants a divorce since she is in love with another man. The woman is bleeding severely from a head wound and has a plastic bag covering her head. What was the cause of death — the head wound or suffocation? To solve the mystery, everyone must be considered a suspect — from her husband and mother-in-law to friends and her illicit lover. A few things caused me problems while reading Doomed to Die. Simpson, a British novelist, obviously uses British spellings and phrases that are now out-of-date and difficult for the American reader. More importantly, however, was the way the mystery finally gets solved. A minute detail that is barely mentioned in the initial presentation of the murder suddenly becomes the catalyst for the crime’s solution. It felt as though Simpson had reached the pagination requirement set by her publisher and then decided to suddenly wrap up her novel in a tidy package. That type of writing always annoys me. I would rather have a short book that tells a great story than one that seems to be circling around on itself in an effort to become more substantial. I’m sad to say that I devoted a few days to reading this novel that I can never get back. This has been the first major let-down on My Library Shelf….and I certainly hope it is not the beginning of a trend. I returned to My Library Shelf project and read The Rosie Effect, the sequel to The Rosie Project. While I really enjoyed the first novel, The Rosie Effect left something to be desired. In the sequel, Rosie and Don are married and living in New York City. When Rosie finds herself pregnant, she begins to doubt if Don will be a suitable father given his “uniqueness” due to his obsessive personality. Don finds himself fighting for his future child as well as his marriage. The Rosie Effect is littered with humorous scenes as Don attempts to learn what fatherhood is all about. However, the novel simply feels like a re-telling of the original novel and loses much of its charm in the process. I’m glad that I was reading the novel while I was extremely busy and was simply looking for something to read that would not require much brain power; The Rosie Effect fit the bill, but it’s not something I would recommend to my book-loving friends.